Wednesday's retail sales report was disappointing, missing economists expectations and raising concerns over the outlook for the holiday shopping season. Within the retail sales report, however, was an interesting nugget that may be worrying for America's major restaurant chains. 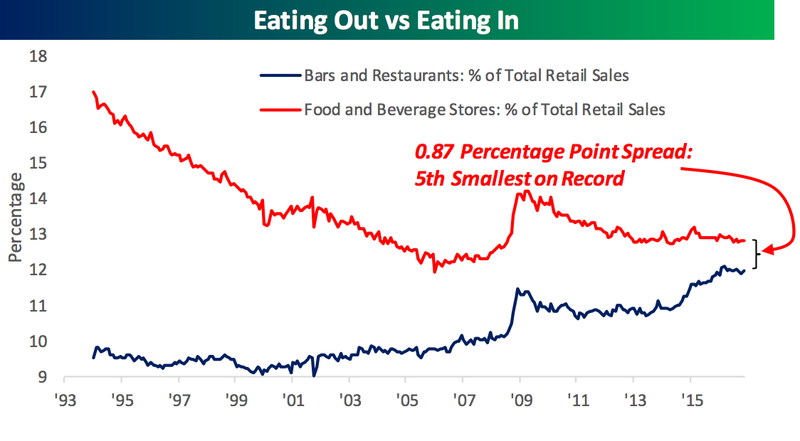 The percentage of retail sales devoted to bars and restaurants in comparison to food and beverage stores was the near the smallest gap in decades according to Bespoke Investment Group. "With Bars and Restaurants accounting for 11.97% of total sales and Food and Beverage Stores accounting for 12.84%, the spread between the two is narrowing," said a note from Bespoke following Wednesday's report. "At the current level of 0.87, this month's spread is the 5th narrowest on record, and the only four smaller monthly readings also occurred in 2016." Despite this, large chains have been reporting steadily declining sales. Falling fast food sales and major chains seeing declines have even led some to suggest the industry is a sign of the broader economy. Executives at these companies even blamed the election for their declining sales. This logically doesn't seem to square. If Americans are devoting an ever-growing percentage of their spending to restaurants, why are all of the industry giants seeing such sluggish business? Applebee’s: Most locations open until 8 p.m.
Baskin Robbins: Open 24 hours. Boston Market: Most locations open 11 a.m. to 6 pm. Buca di Beppo: Most locations open 8 a.m. to 10 p.m. Chart House: Most locations open 4:30 p.m. to 10 p.m.
Cracker Barrel: All locations close at 2 p.m.
Dos Caminos: Closes at 9 p.m.
Fogo de Chão: Open 11 a.m. to 10:30 p.m.
Maggiano’s Little Italy: Open 11:30 a.m. to 10 p.m.
Old Country Buffet: Open 11 a.m. to 3 p.m.
Outback Steakhouse: Most locations open 8 a.m. to 3 p.m.
Ruby Tuesday: Most locations close at 9 p.m.
Smith and Wollensky: Main dining room open 4 p.m. to 10 p.m.
Starbucks: Most locations open 6 a.m. to 9 p.m.
Now this may mean that nominal sales are sliding, but it also indicates another change: people are choosing smaller restaurants when they eat out. Essentially, the spending on eating out is increasing but industry measures of larger restaurants are missing out on the growth of local bars and eateries. Colloquially, this would match the "eat local" trend that seems to have grown into almost a cliche, but at least in this case there is some data to back up it up. As we noted before, Bank of America credit card customer data also indicated that Americans are choosing smaller, local restaurants over the largest chain brands when they eat out. While its unclear the reason why, part of the shift may be due to the fact that smaller restaurants can adjust their prices easier when ingredient prices drop. Right now the cost of food at home — basically groceries — is actually declining, while food away from home — restaurants and bars — is increasing. This has been cited as a reason by industry insiders for the fall in sales. 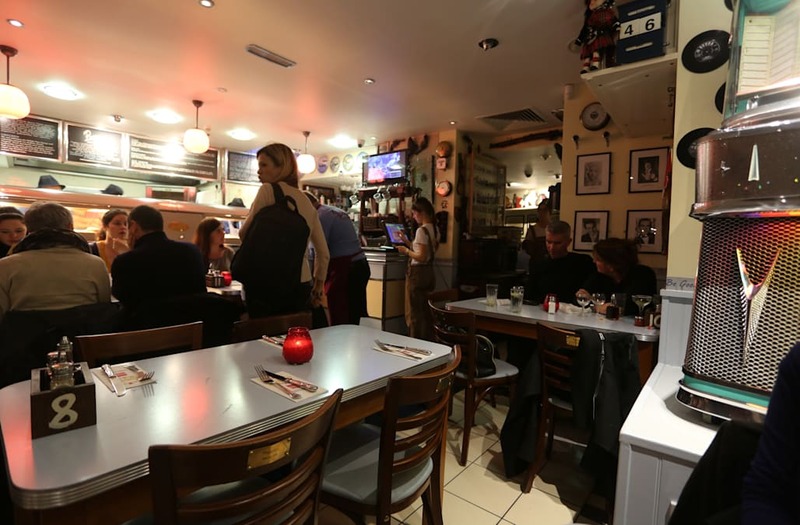 It may also indicate why more people could be choosing smaller, local restaurants. Instead of protecting and growing margins like a large restaurant, smaller stores can fluctuate prices as their inputs get cheaper to attract more customers and protect sales. Whatever the reason, it appears Americans are eating out but choosing the local corner diner over the massive chain at the mall.